This year at the PreK/Kindergarten we did a Pilgrim study for most of November. Our focus book was Molly's Pilgrim by Barbara Cohen and we read several support books about the lives of pilgrims. One thing we learned was how different the lives of Pilgrim children were so different from our lives. Everyone was shocked by the amount of work they had to do. They also got a good giggle about how Pilgrim boys wore dresses until they were 6 or 7! 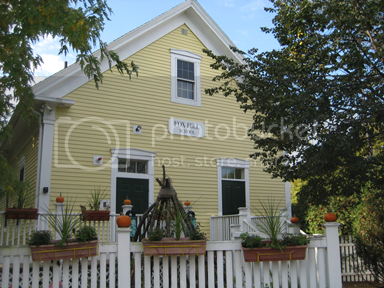 One common theme in all the books was corn and how it helped the Pilgrims survive in Plymouth. I found a really cute torn paper Indian corn project on Pinterest, and decided to use that for inspiration for our corn project. Instead of only using torn paper to make our corn, we decided to use different types of art media. First I cut out 3 ears of corn per child - since I only have 10 in my class, this wasn't that hard. The shape is basic enough that I think kids could cut their own, but we were short on time. For the first ear, we used torn paper. First we tore a bunch of red, yellow and orange construction paper into tiny pieces. This was hard for my friends (and for me!) but they did a great job. 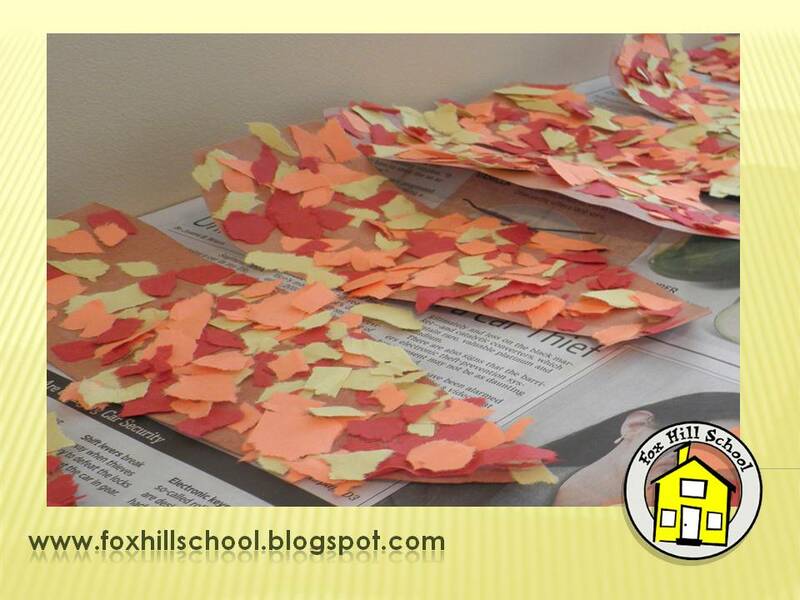 Once all of our paper was torn, we painted school glue onto our corn, then sprinkled the torn paper on top. We concentrated on covering the entire cob with torn paper. While these were drying we started our second ear. 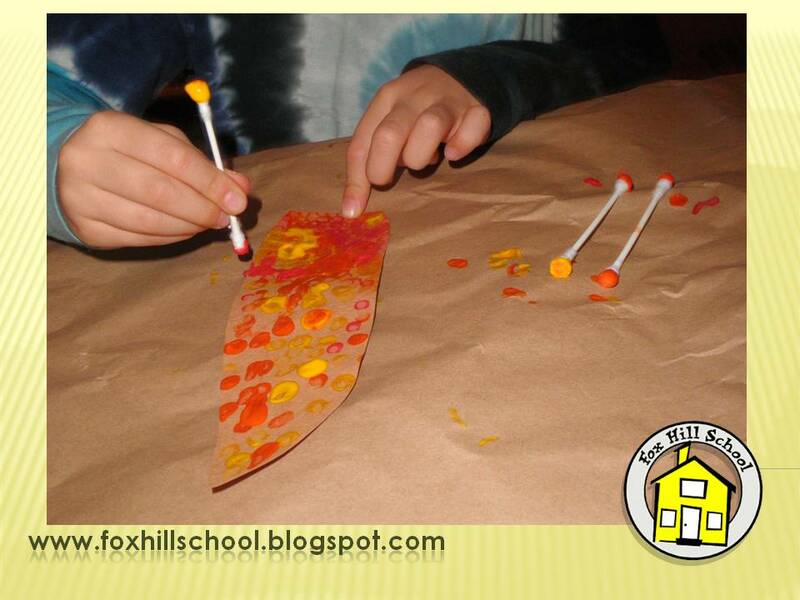 This time we used red, orange and yellow tempera paint and q-tips to create our kernels. Again, we focused on covering the entire cob with color. For the third ear we used soft pastels. We put out different shades of red, yellow, and orange, and asked the students to draw and smudge kernels again covering the entire cob. Once all three cobs were dry, we assembled them by gluing to a large piece of white construction paper. We made corn stalks for the tops by cutting the top of a brown lunch bag into strips and then crumbling them. For the last couple weeks, our focus book at the PreK/Kindergarten program has been Molly's Pilgrim by Barbara Cohen. (Ms. Christina's favorite Thanksgiving book!) In the story, Molly, a recent immigrant, has a homework assignment to make a pilgrim doll out of a clothespin. Her mother helps her make the doll but it doesn't look like the pilgrims Molly is learning about in school. Her mother considers herself a pilgrim so she makes the doll in clothes from her homeland. So as it happens in the story, we too asked the kids to make a doll out of a clothespin, dressed in clothing that represents their heritage. While the kids were working on their dolls at home, in art class, we made a village for the dolls to play in when they got to our school! We saw this super cute and easy project on the internet a few years ago so we tried it out. 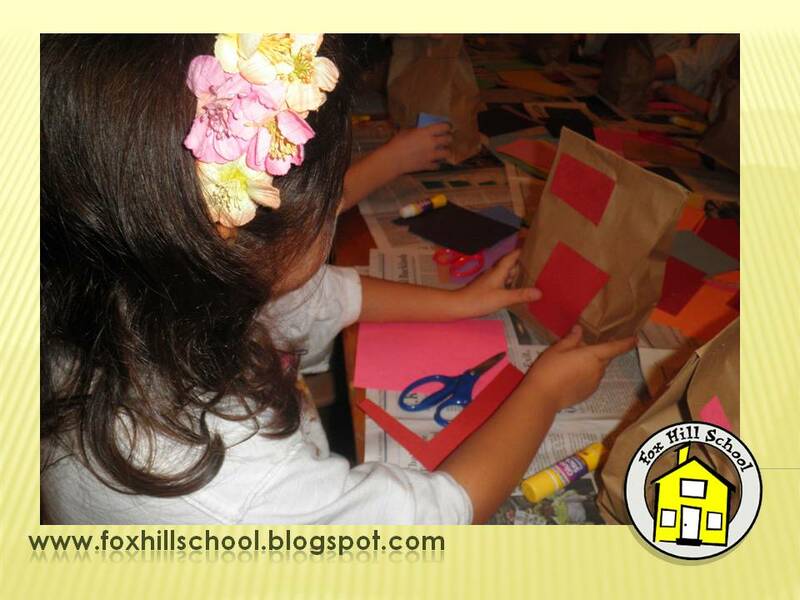 Each child received an ordinary brown paper lunch bag and newspaper to crumple up and stuff into the bag. Then we folded over the top of the bag and stapled them shut. The kids were then given construction paper, scissors and glue sticks and asked to decorate their house with windows, doors, chimneys - whatever they wanted on their house. They did and AMAZING job with this project! The houses had well thought out accoutrements and lots of detail! 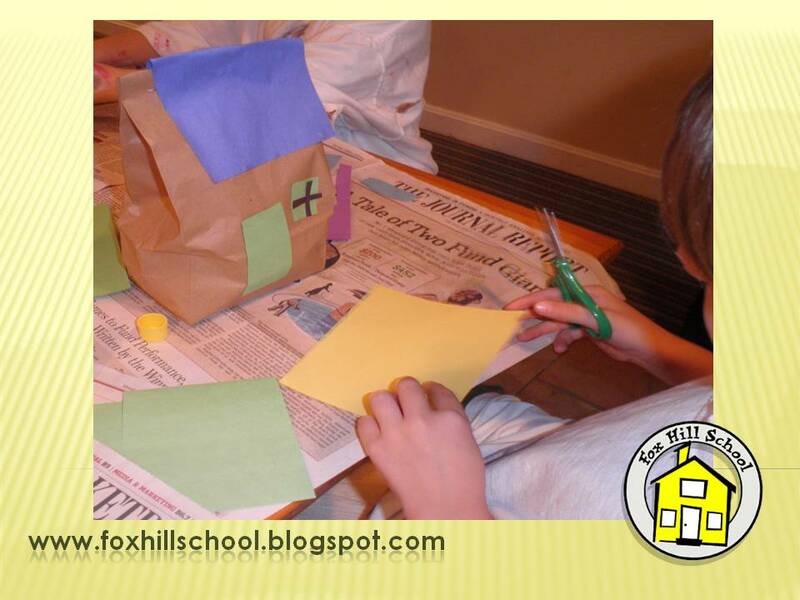 We let the houses dry while we waited for the dolls to come to school. 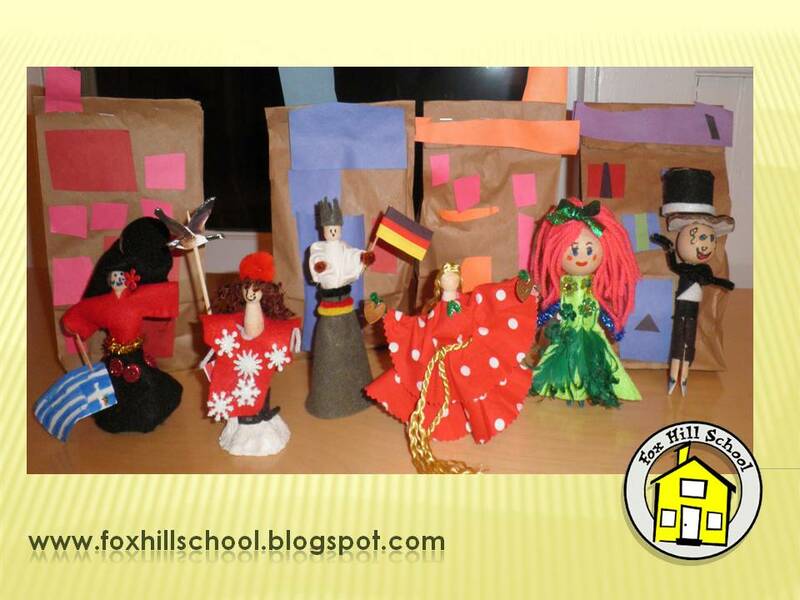 Once all the dolls arrived at school and the children were able to present their dolls to the class, we got out the paper bag houses and let them arrange them into villages for their dolls to play in. We only have 10 kids in our class so our village was not very large, so the kids added block structures and roads to their paper bag villages! So creative! We were so thrilled by how much the thought and effort the families put into this project! The kids were so proud and happy with their dolls, they play that resulted was extremely thoughtful and engaging. A big hit for everyone involved! 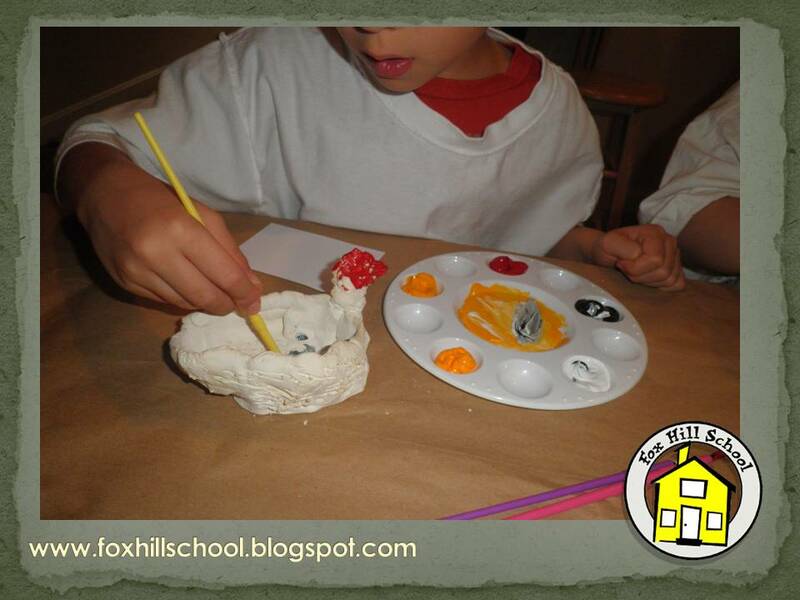 Last year when we started the the Kindergarten program at the Fox Hill School, we wanted to have a class mascot. We have one at the preschool and it has been a big hit (more on that in another post!) So before school started we invited all of the incoming students and families to meet us a our local Build-A-Bear to pick out a mascot. They chose a monkey! 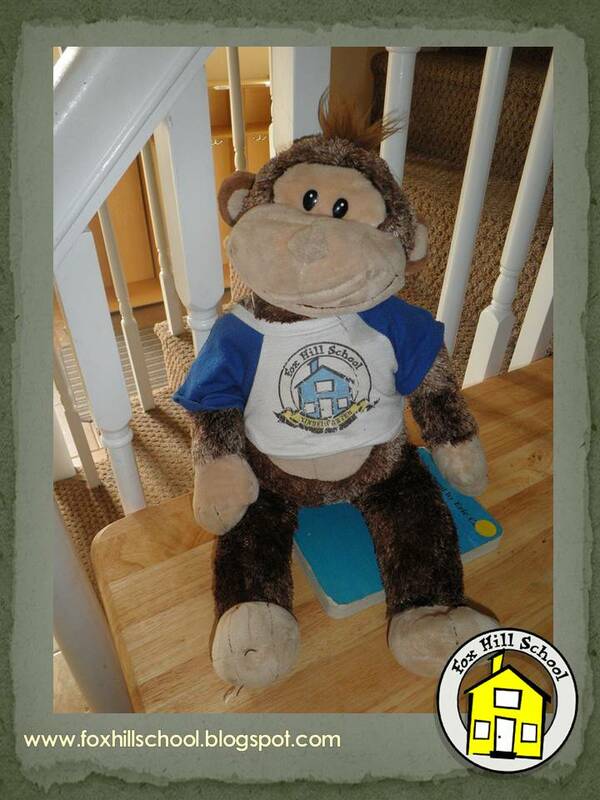 They all got to put a heart into the monkey before it was sewn shut, then they gave it a "bath" and got it ready to take to its new home at our school. During the first week of school we voted on what our monkey's name should be and after much deliberation, they decided on Bananas! The girls thought the monkey was a girl and the boys thought the monkey was a boy so the name Bananas worked perfectly! Then we had the parents sign up to have their kids take Bananas home for a week at a time. We use this great free website any time we need to have parents sign up for something called Sign Up Genius. This way the parents can sign up from their computers which has been much more convenient and organized since we switched to this type of sign up. Each child got to take Bananas home for a week. They were responsible for him/her and the kids had to document Banana's visit with them in the journal that is sent home in the travel bag. All of the kids wrote a little about their week with Bananas. Some chose to draw pictures of their adventures, but most chose to document with photos to accompany their words. Over the course of the year, Bananas went to the dentist, attended a yoga class, went apple picking and even met the Mayor, just to mention a few entries! Bananas is no longer traveling light either. The travel bag is filled with costumes, pajamas, shoes and, of course, a New England Patriots football helmet, just like every good New Englander should have! The kids loved taking Bananas home for the week and then coming back to school to share their journal entries with the class. 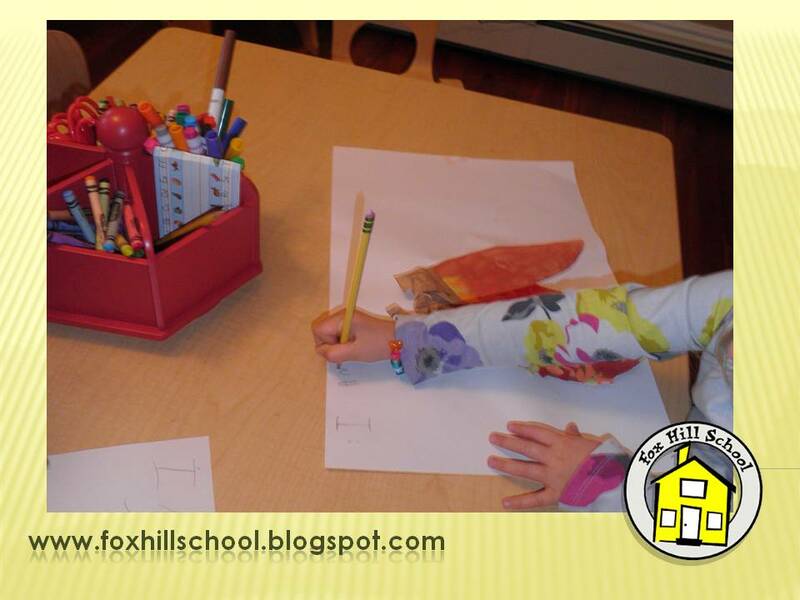 This is a simple way to encourage writing and creativity with the kids as well as give them a chance for show and tell - every Kindergartner's favorite activity! Negative space that is! 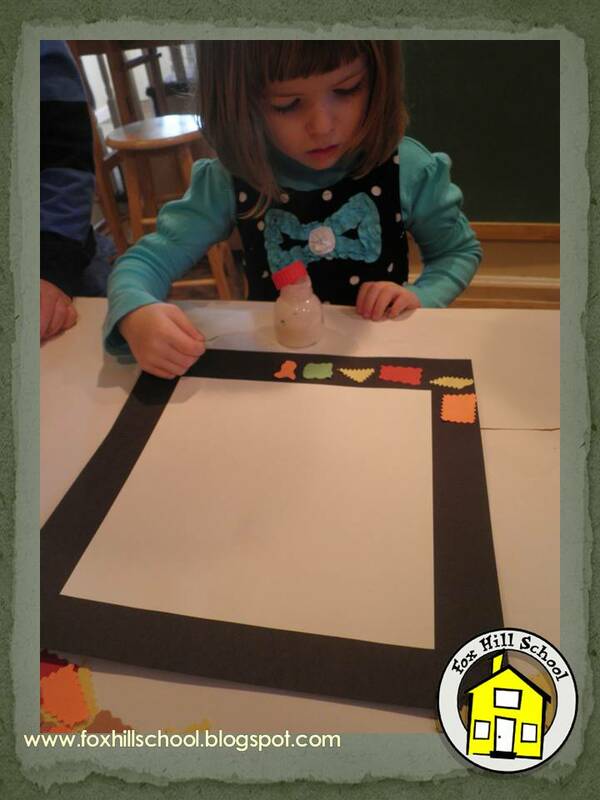 In art class at the Kindergarten we learned about an art concept called "negative space." The definition in Wikipedia is "Negative space, in art, is the space around and between the subject(s) of an image." Usually when kids create art, they draw a picture and leave all the space around the picture white. The white part is the negative space. We read Owl Moon by Jane Yolen in art class and looked at the illustrations to see examples of negative space in the art work. This is a a fabulous story, the illustrations are wonderful and the kids loved looking for clues about the owl by looking at the pictures. Then I explained that we would be making a picture by coloring everything except the subject of our picture. In this case we tried to draw trees (like the ones in Owl Moon) by only coloring the area around the tree and not the tree itself. They thought this was a pretty cool idea and jumped right in. 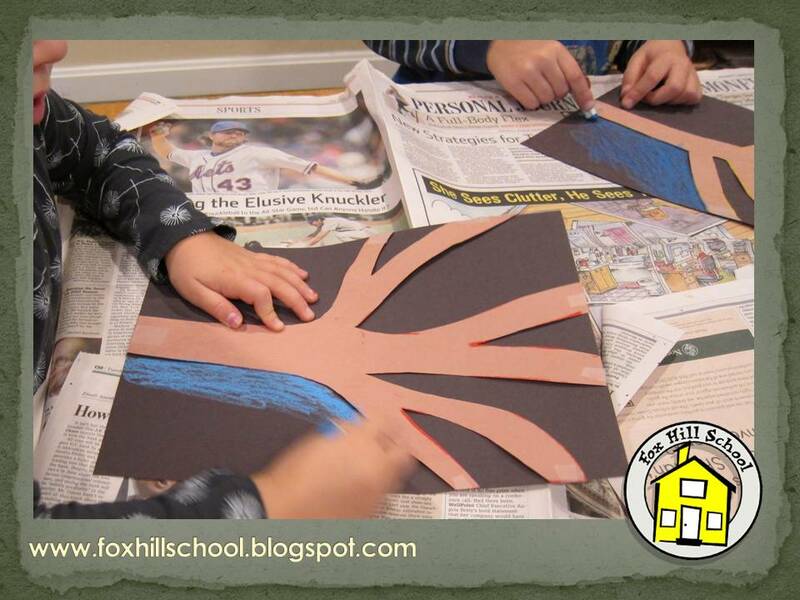 To help the kids with the concept, I taped construction paper cut-outs of trees onto black construction paper. 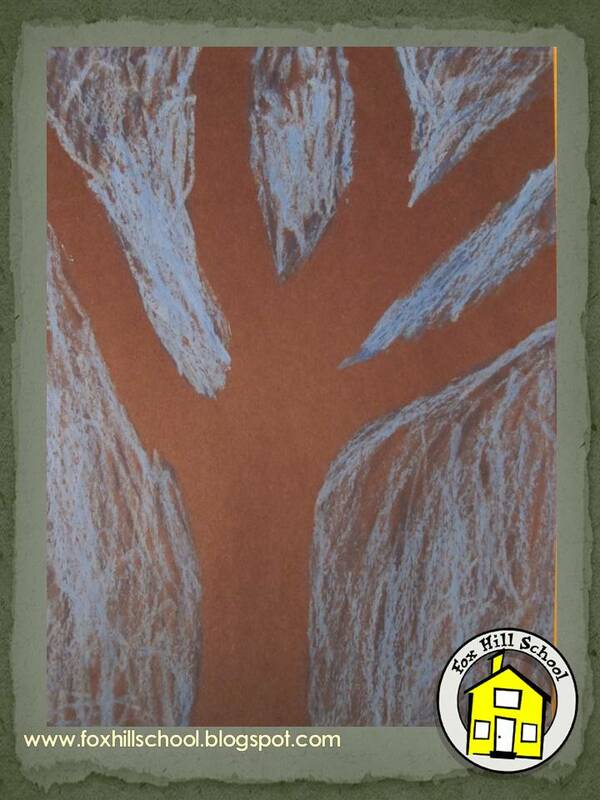 The kids used shades of blue and grey oil pastels (like the colors the illustrator used in the book) to color all around the tree. 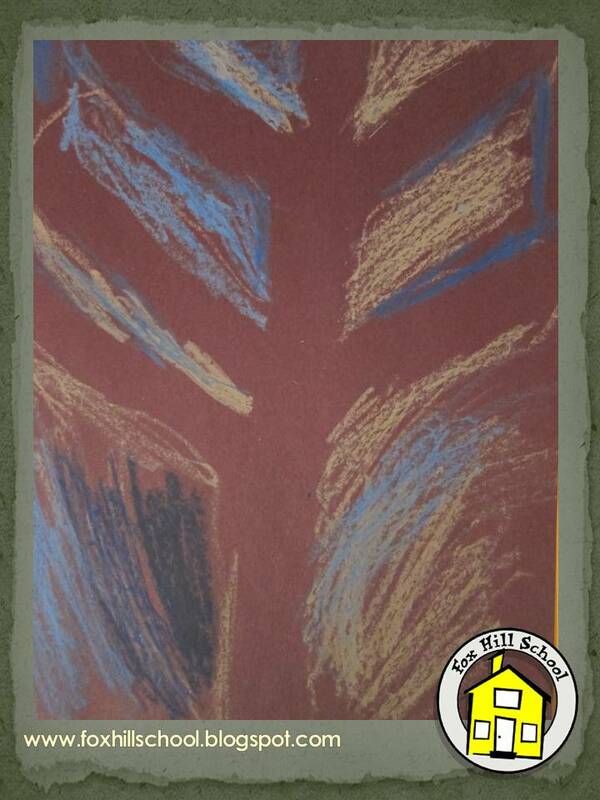 Once they were finished, we removed the construction paper tree and they were left with a tree made out of the negative space in their drawing! They were quite amazed with themselves and now they have a basic understanding of the concept of negative space. Communicating with the parents at the Fox Hill School is one of our main priorities. 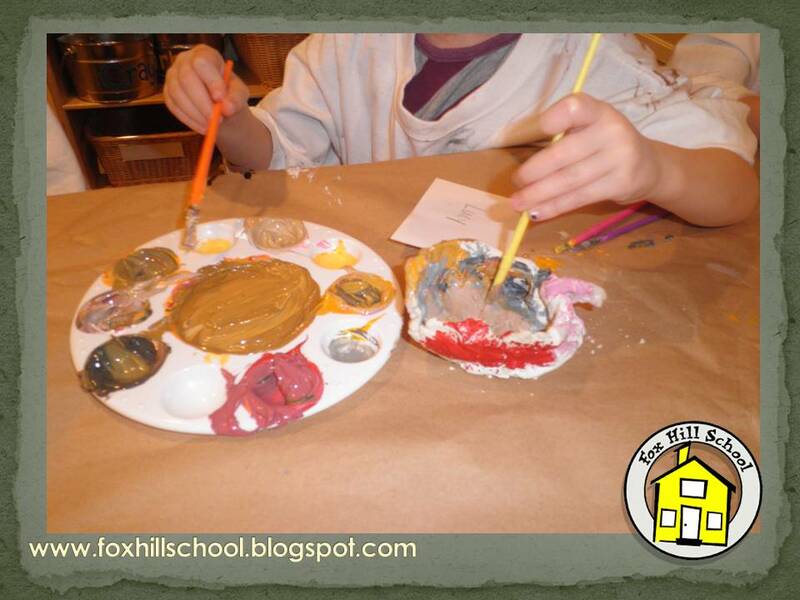 After a year of picking up my son at daycare (before he was old enough to attend the Fox Hill School) and hearing every day was "fine" or "great" I was inspired to make sure the parents at our school knew as much as they wanted to about their child's day at school. Since parents all like to receive information in different ways, we try to disperse information in as many ways as possible. One thing I love just as much as children's literature is photography. We take hundreds of photos each week to document the children's work. Immediately when you walk into the Fox Hill School you see giant pictures of children during their day at school up on the walls. 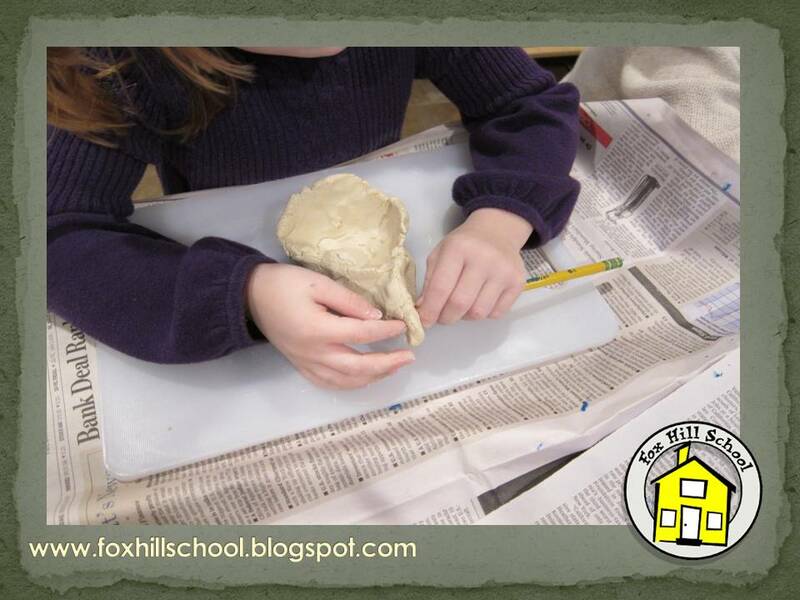 We choose photos that represent all of the fun and creative things the children do each year at school. I order the poster prints in a 16in. x 20in. size and mount them on standard sized black foam core. This makes an instant frame for the giant photos. Since a picture is worth a thousand words, we can present our daily curriculum and routines through these pictures without having to say a word! These giant prints can be expensive, but I order them from an online site called Winkflash. They often have sales on their products; right now they have these posters for 40% off so they are quite reasonable. Another way we communicate our special events is through photo montages. I use an online site called One True Media. If you have a special event and want the families to experience it even if they couldn't be there, this is a great option. The kids also love seeing themselves on the computer! You can make montages for free out of the digital photos you take during the day at school and send them to the parents in your program. Click here to see an example of one of our montages on One True Media. 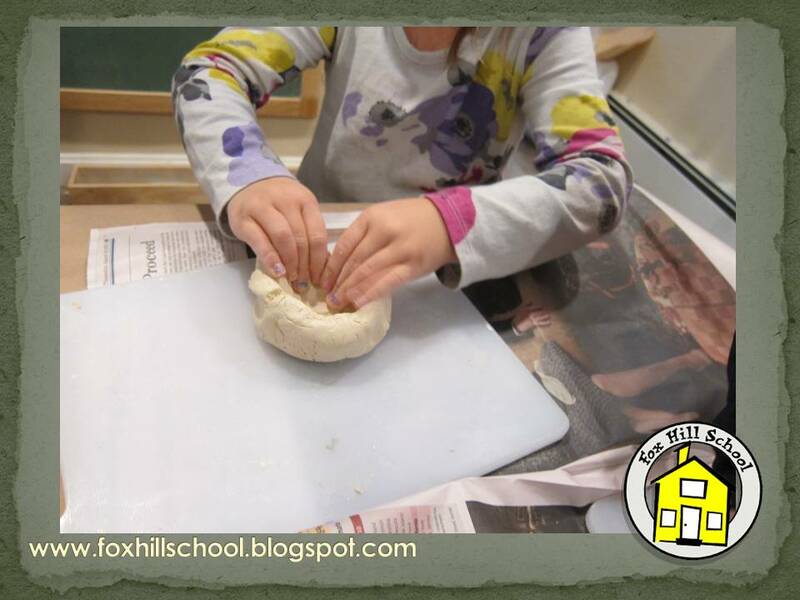 These are just a couple of the ways we try to keep our families "in the loop" regarding the day-to-day activities at the Fox Hill School. Check back soon for more ideas about how to keep your families informed! 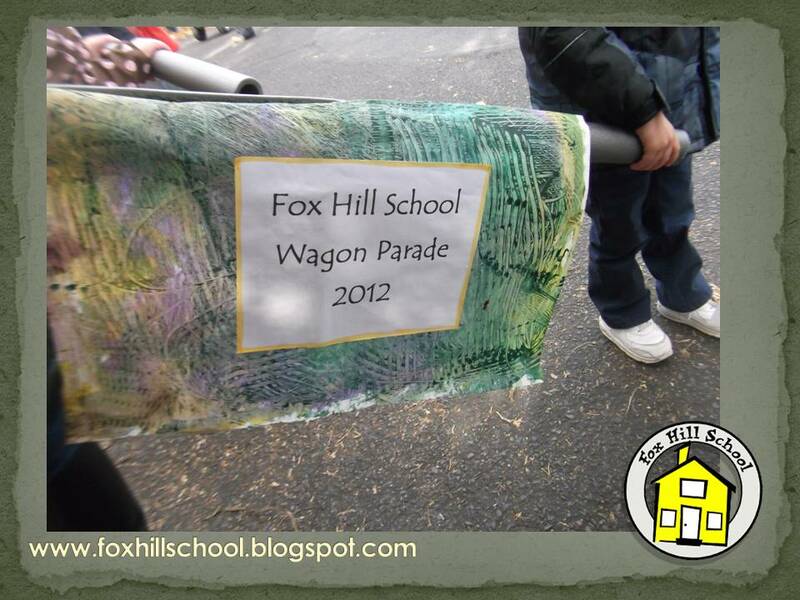 The Fox Hill School Wagon Parade! As I mentioned yesterday, we started our new focus book called Balloons Over Broadway by Melissa Sweet. Click on the book cover to learn more about this book! Today we had our very own version of the Macy's Thanksgiving parade! 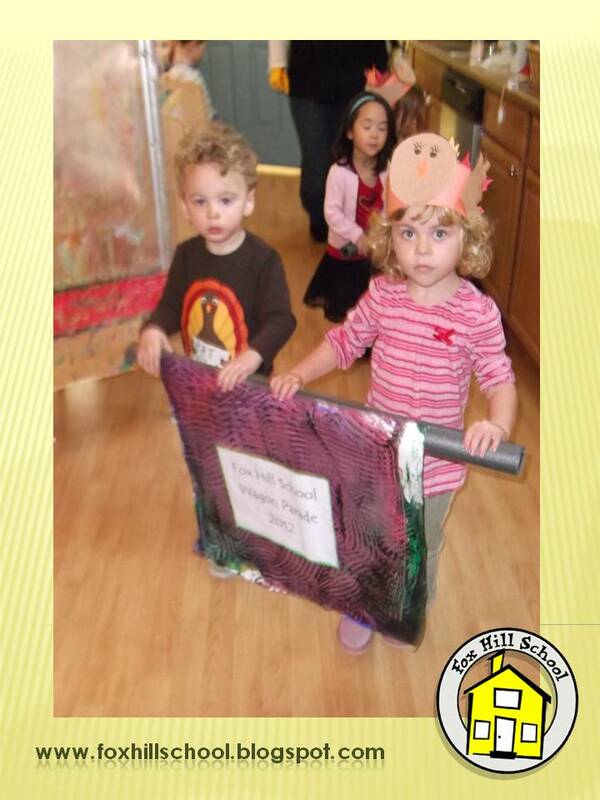 We asked families to decorate a "parade float" using a wagon. The parents and kids created the most amazing wagons and they brought them to school this morning. The floats all had different and original themes. The parents were invited to join us for the parade which was scheduled for one half hour before pick up time. We had just as many families who were able to participate in this event as those who could not (as it was scheduled in the middle of the day) so kids who did not make a wagon got to hold the special banners we made and lead the parade! In the story the people in the parade were dressed up in all sorts of costumes so the kids all wore the turkey hats they made earlier in the week during the festivities! We marched around our circle driveway many times while we played marching music in the background! We have asked the kids to watch the Macy's parade on Thanksgiving (we don't usually assign "TV" homework) and to draw a picture of their favorite part. Then next week we will continue our discussion about parades and see what parts the kids found most interesting. We learned that the Macy's parade was started by the employees at Macy's, many of whom were immigrants, and they brought their traditions from their countries to the parade. Next week we are going to use that information to start our discussion of the holidays and how each family has their own special traditions. 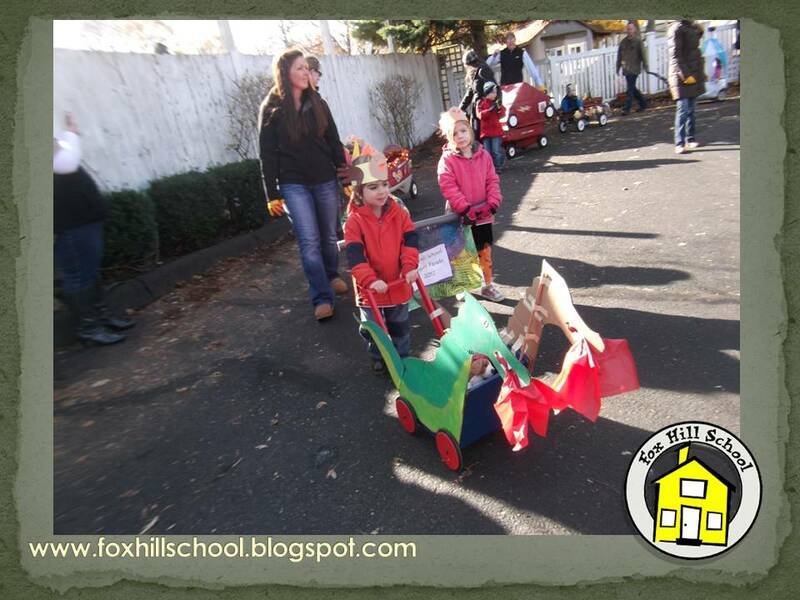 Our wagon parade was a great start to learning more about our families this holiday season! Our focus book for the last several weeks has been Thanksgiving at Our House by P.K. Hallinan. This fun story reflects on all aspects of Thanksgiving, including counting your blessings, the importance of friends and family, Thanksgiving dinner and Thanksgiving activities such as playing football, bringing goodies to neighbors and watching the parade on TV. This story has provided us with a cornucopia of information to help us learn about and understand all that is Thanksgiving! 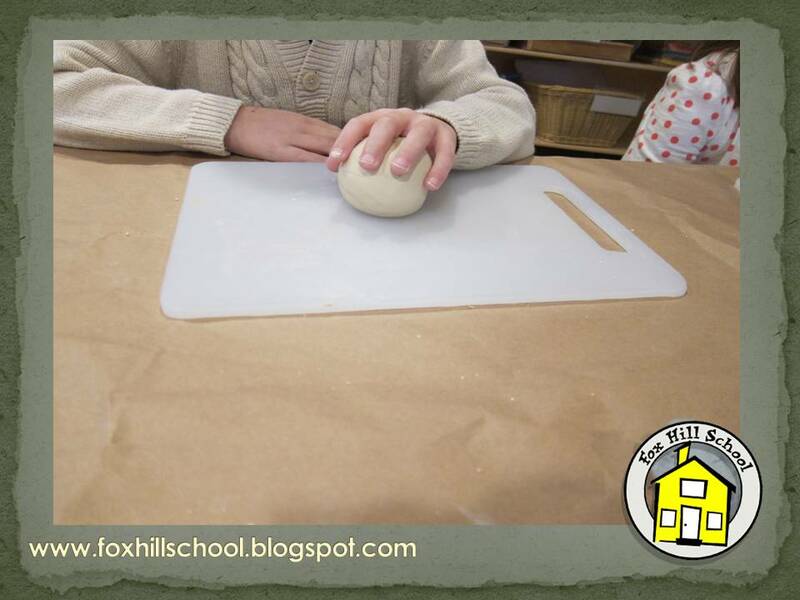 At the Fox Hill School our "sand table" rarely ever contains just sand. We use our sensory tables as just that, a way to explore all types of new and interesting sensory experiences. The story speaks of Thanksgiving food such as turkey and cranberries. This week we put water and fresh cranberries in the sensory table. 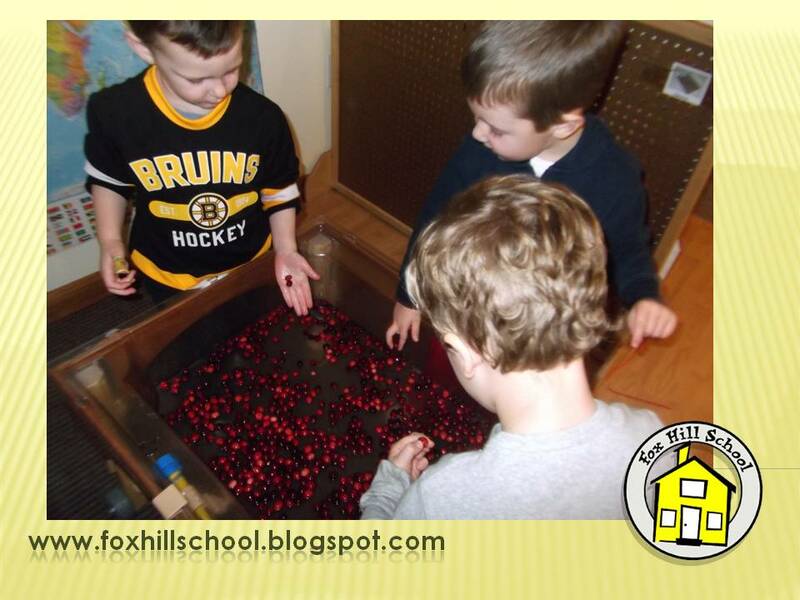 Some kids had never actually seen or held a real cranberry so it was super fun to play with them in the sensory table! Another fun topic that is discussed in this story is watching the parade on TV with your family. Clearly the author is referring to the Macy's Thanksgiving Day Parade. What child doesn't love a parade?!? We used the parade as a segue to our next focus book, Balloons Over Broadway by Melissa Sweet. This is a fabulous story about Tony Sarg, the man who invented the balloons in the Macy's Day parade. The illustrations in this book are whimsical and captivating and the kids just love the story! As part of our Thanksgiving celebration, we decided to hold our own Macy's Thanksgiving parade! Since Thanksgiving is all about family, we are getting our families involved in our parade. 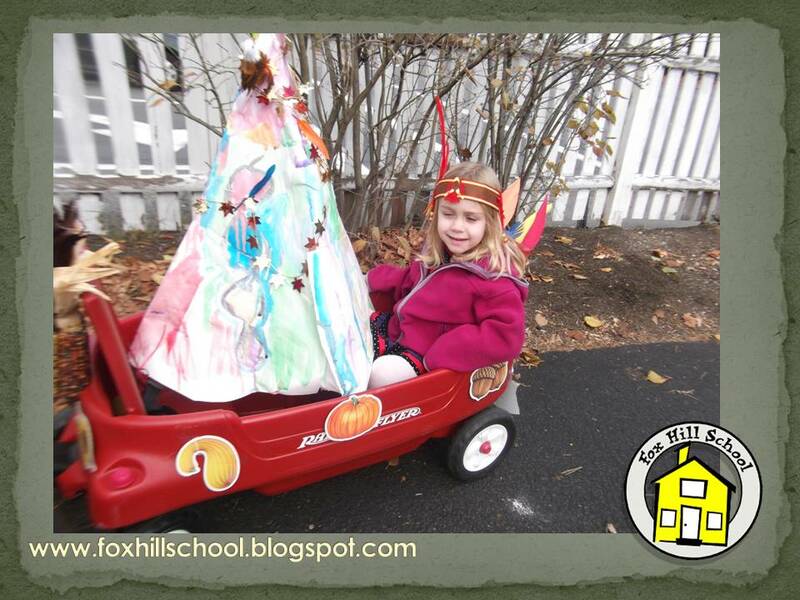 Families were asked to decorate a wagon (our version of a parade float!) and bring it to school for our parade. 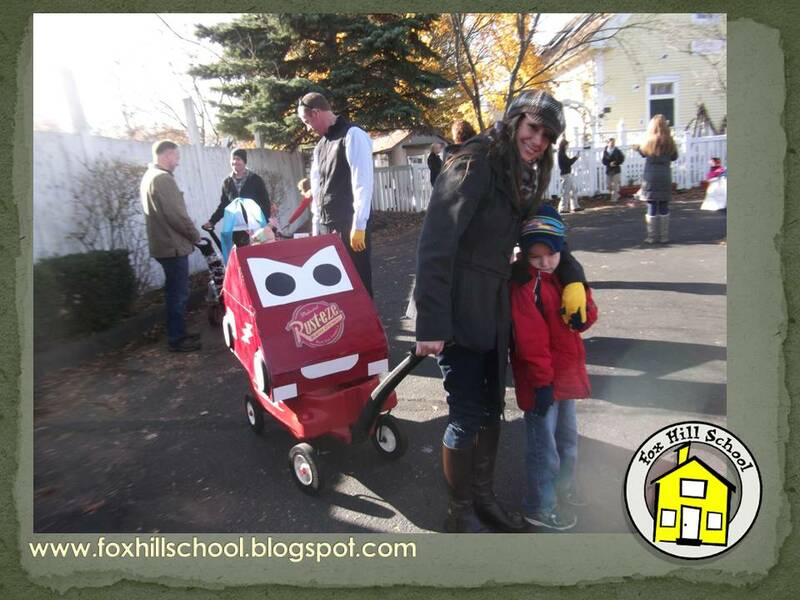 The parents are invited to view and/or participate in our parade the day before Thanksgiving as the kids pull the wagons around the circle driveway in front of our school! In preparation for the parade, the kids made turkey hats to wear as costumes during the parade. These simple hats are made from sentence strips and construction paper. The kids made signs and banners to hold during the parade. 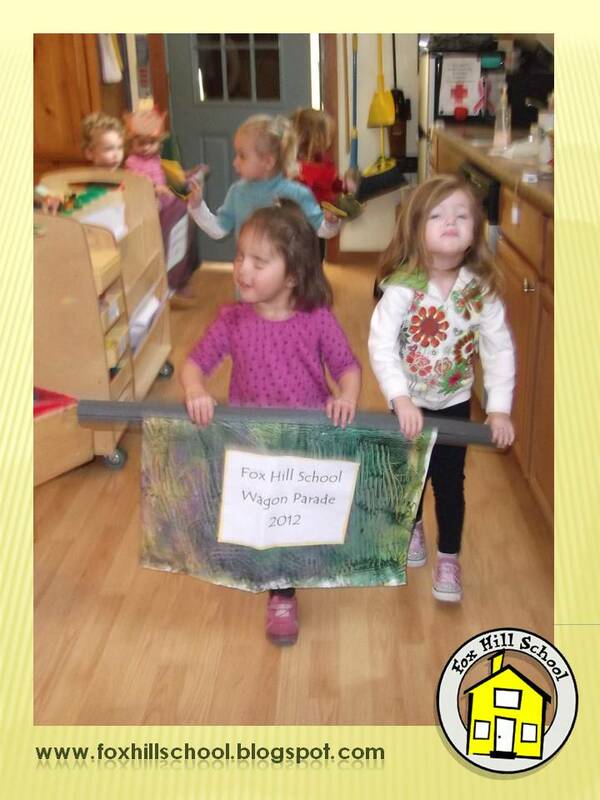 Since most of the preschoolers have not been in a parade before, we practiced our marching inside holding our parade banners. It takes teamwork and cooperation to look professional in a parade! 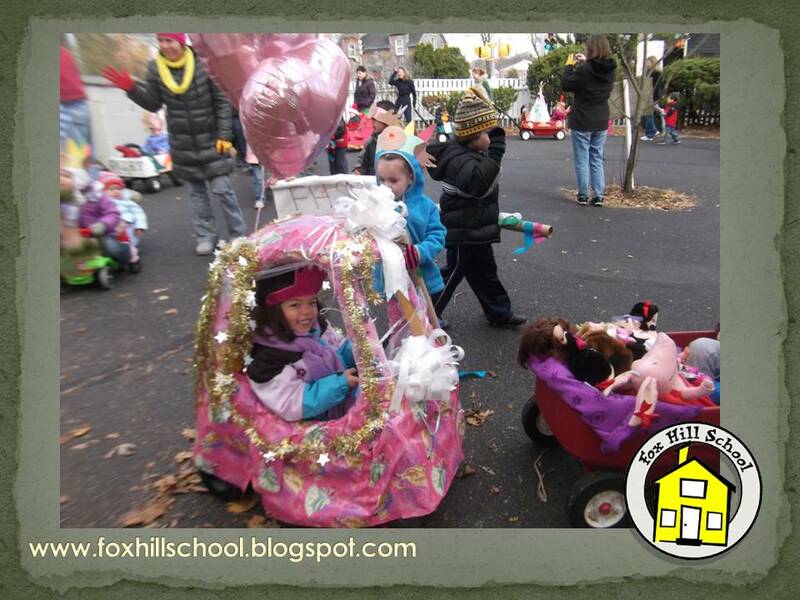 Check back tomorrow to see the Fox Hill School Thanksgiving Parade in action! Although Thanksgiving is my absolute favorite holiday, I have to say that this year (at home anyway!) I feel like I'm almost missing it. My kids convinced me to put a giant red nose and reindeer antlers on my car on Veteran's Day and the XM radio is parked on the "holly" Christmas music station and it's not even Thanksgiving! I actually enjoy the entire "Hallo-Thanksgive-Mas" season, but we slowed down a bit at school and really explored all that Thanksgiving has to offer! First, I mounted a square piece of white paper (9x9) on a larger piece of black construction paper (12x12). My daughter and I cut out all kinds of shapes out of Thanksgiving colored construction paper with Krazy Cut Scissors over the weekend. You could have the kids cut their own shapes if you wanted, but in the interest of time we cut the shapes in advance. Then I put all the shapes in the middle of the table and asked the kids to think of the black space around the paper as the frame for their soon-to-be turkey art and to glue down the shape pieces on the black paper. It was very interesting to see how each child approached this task. Some glued on the colored shapes willy-nilly and others made a purposeful pattern with the shapes. There is no wrong way in art so they all looked unique and cool! As the kids completed their frames, I painted their hands with fall colored tempera paints and had them press their hands into the middle of the white paper. This worked well as the kids did not all finish their frames at the same time. Once the paint was dry we added legs and other turkey embellishments with markers and we ended up with (children's) museum quality turkey art! 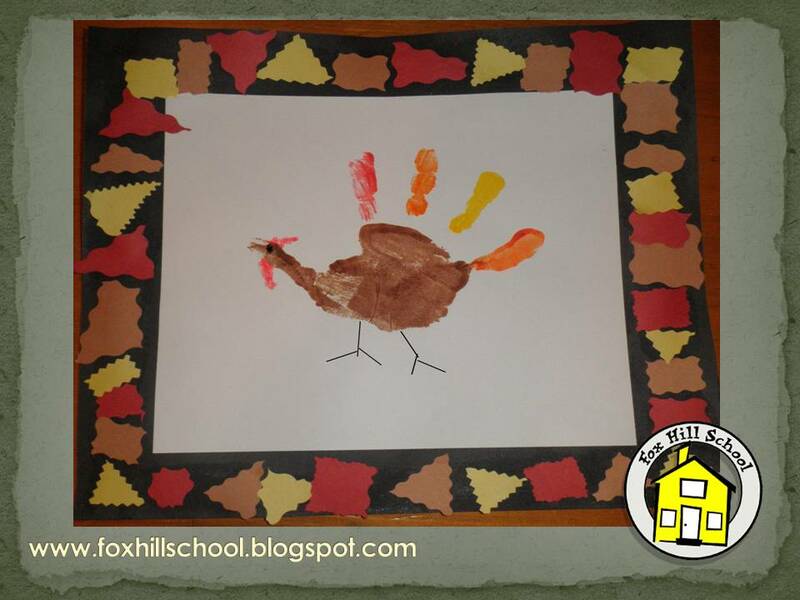 The frames really make the art pop and the kids enjoyed designing their frames and turkeys. Now that the turkey hand prints are done - bring on Black Friday! (from my computer, in my pajamas of course!) Happy Thanksgiving! Group time turns into Game Time with a fun auditory discrimination game of "Who's Gobbling?" Explain the rules ahead of time: Everyone closes AND covers their eyes. One child will be tapped on the head, and this child becomes the "Gobbler." The Gobbler says, "Gobble! Gobble!" Have the others guess who it is WITHOUT looking! Explain there is NO PEEKING! If you peek you do not get to guess!!! This game is so much fun, and the children really quiet themselves so they can try and figure out who the gobbler is! When someone guesses the Gobbler correctly, ask them how they knew who the Gobbler was. Their comments and observations are always very interesting!!! Remember to ask open-ended questions so they aren't simply agreeing with you! How did you know? What was a clue? etc. If the same children peek repeatedly, make sure you explain to them what peeking is. At this age they might not know!!! 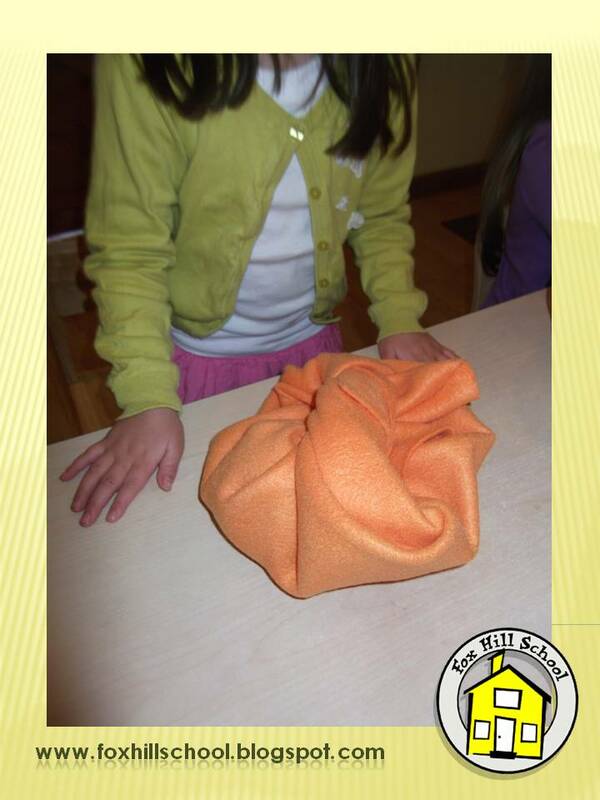 Teacher Tip: Play this game as a transition activity for washing hands, lining up for recess, and more! For the last child on the rug, have the teacher be the Gobbler, so he won't feel cheated out of his turn! Since we got into the "blog world" I've been following a couple blogs. One I really like is called Art Projects for Kids. 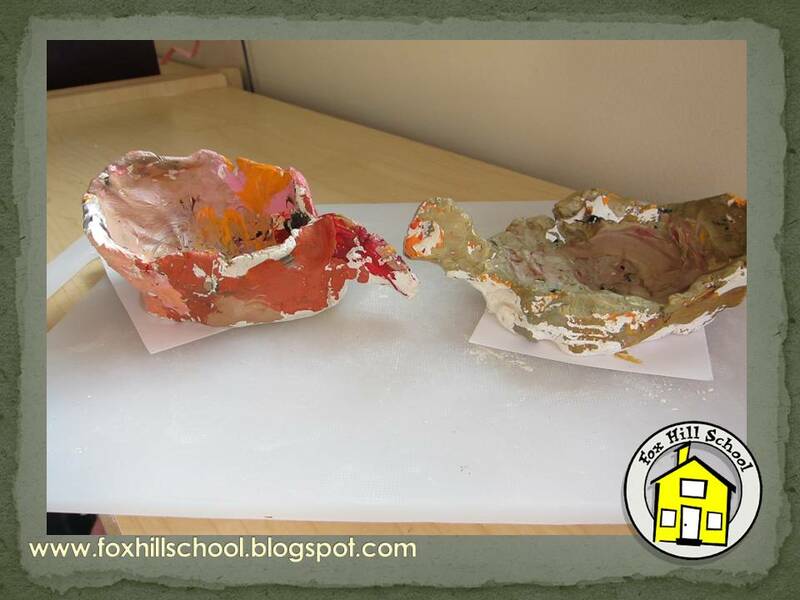 In the past I have made clay pinch pots with my PreK and Kindergartners but this year I saw a new twist on the pinch pot on this blog - the Turkey Pinch Pot! 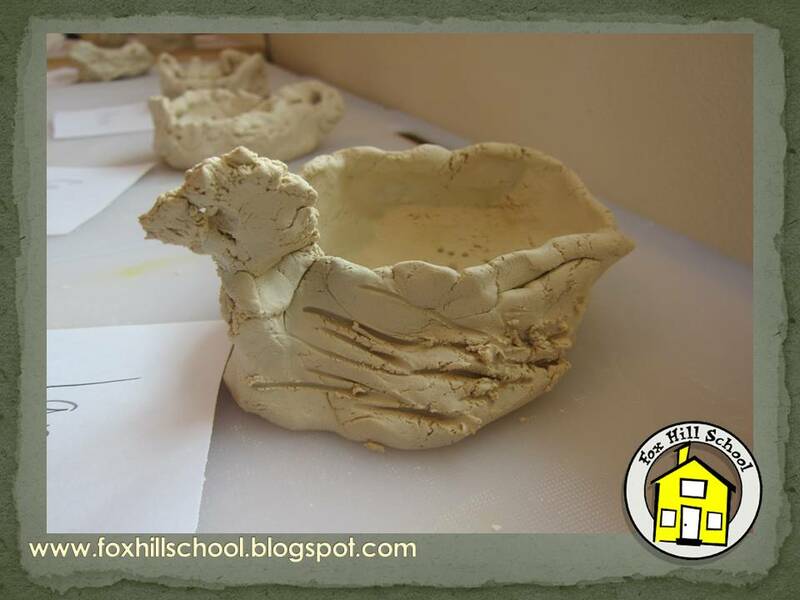 The kids LOVE working with clay (and so do I!) so we tried it. 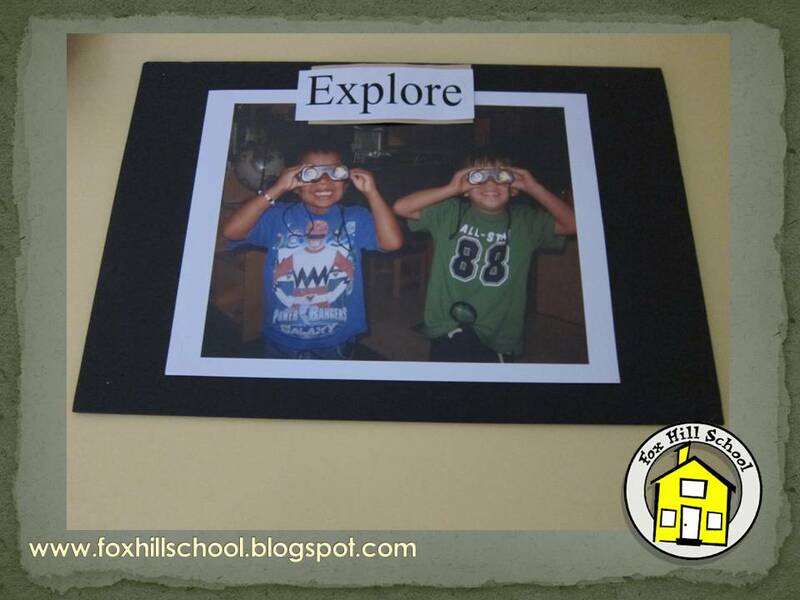 The blog suggested the project for kids 1st grade and up, but the PreK/Kinders did an amazing job with them! First, I gave them all a lump of clay. 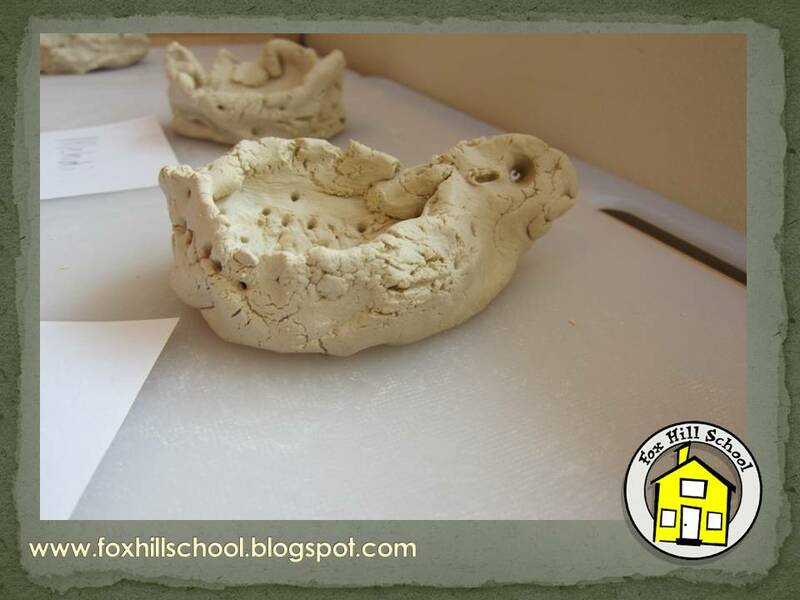 We use air dry clay since we do not have access to a kiln. Then I told them that they needed to squeeze and mush the clay in their hands while I read the story A Plump and Perky Turkey by Teresa Bateman. 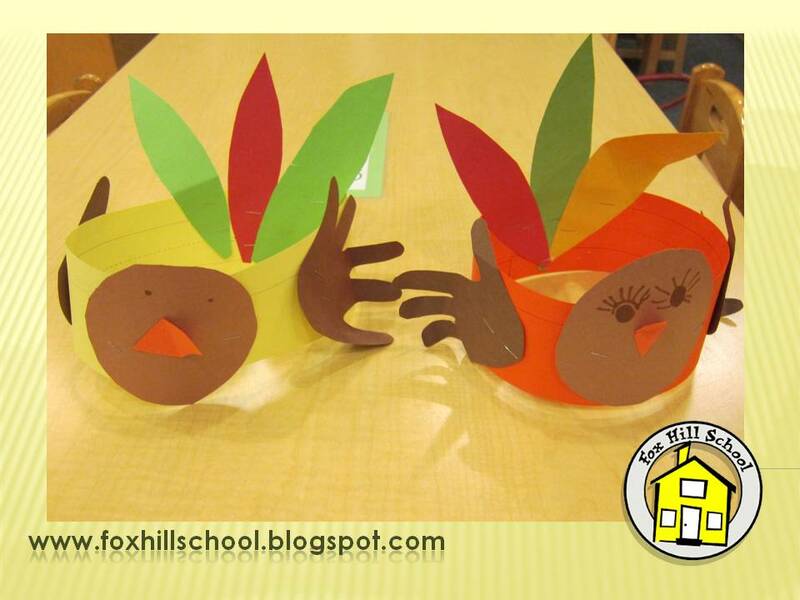 The story talks about a turkey art show so it was perfect for our turkey pinch pot art class! So we squeezed in some fine motor while we were loosening up our clay, which they then rolled into a ball. We proceeded as you would a normal pinch pot. Put your thumb in the middle to make a hole and then pinch your fingers and thumb together to form the sides of the pot. Once they did that part, they pinched together one side of the pot to form the head of the turkey and lifted up the opposite side to make the tail. Then I gave them pencils to make scratch marks for tail and wing feathers. Some of them used the pencils to make little dots on their turkeys and they look quite cool! It took a couple of them a few tries before they were happy with their pots, but they enjoyed smushing them and starting again! Then we set them aside to dry until the next art class. During the next class I have them all their own palette of acrylic paints to use to paint their turkeys. I have put out community paints in the past, but I find that there are always some kids who like to mix all the colors and that doesn't go over well with the kids who don't. This way each child is free to mix and create as they please with no arguments! 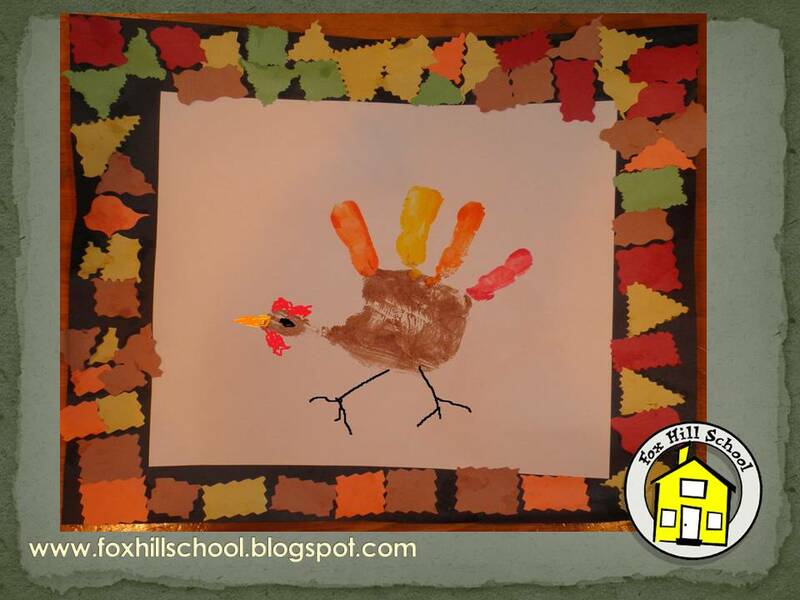 I explained how to use the middle of the palette to mix the colors and they really created some amazing colors for their turkeys! While they were creating they were talking about what would happen if they made their turkeys out of oatmeal or soap as they do in the story - they agreed they would not be as great as these turkeys! They were all complimenting each other on their "awesome" turkeys! Such a fun way to get ready for Thanksgiving! 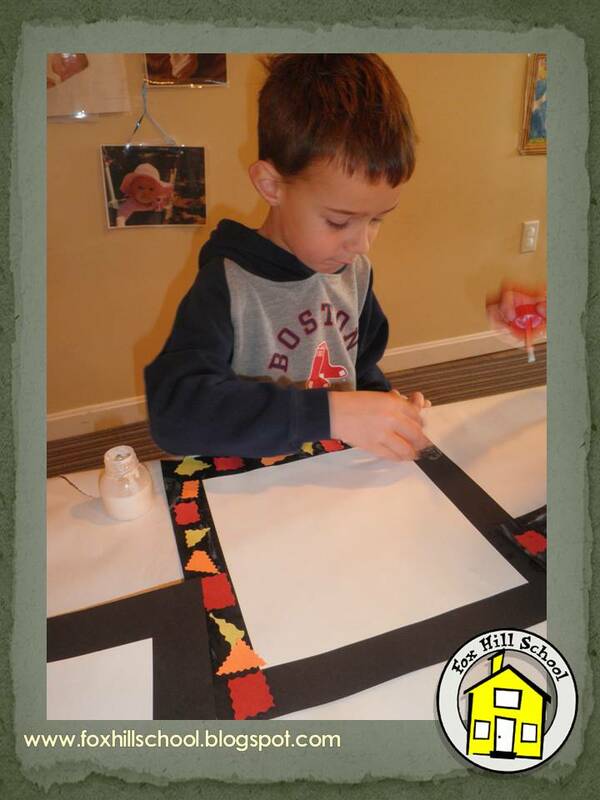 Turkey Woodworking, Art & Fine Motor! One of our support books, A Plump and Perky Turkey by Teresa Bateman, talks about a town that holds a turkey art show to try and trick a turkey into coming to their town for Thanksgiving. This rhyming, clever story is one of my favorites! 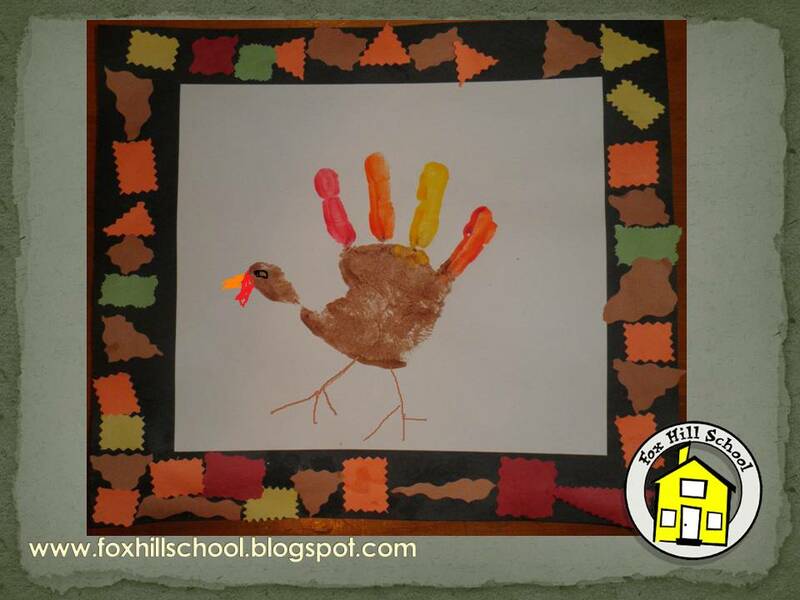 We let the kids know that one of our activities would be to make some turkey art of our own! 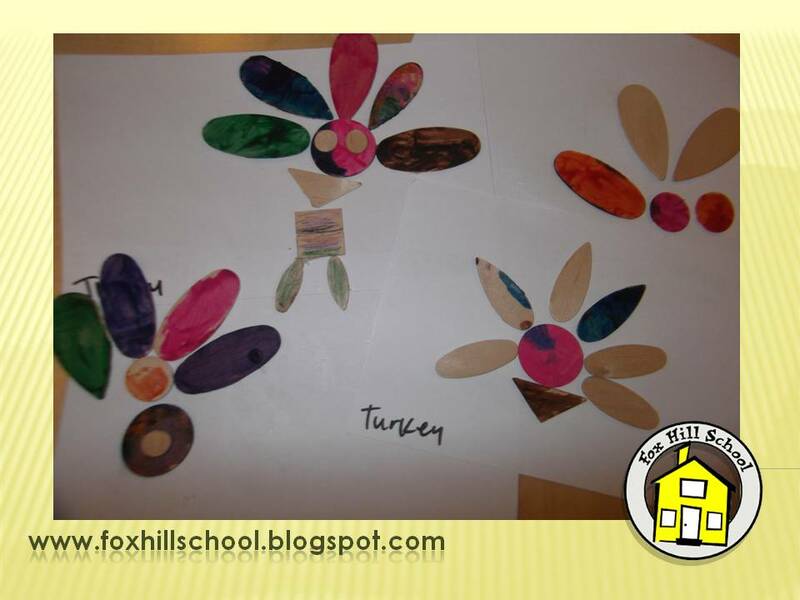 We set out all sorts of wooden shapes, glue sticks and index cards and asked them to try and make a turkey. 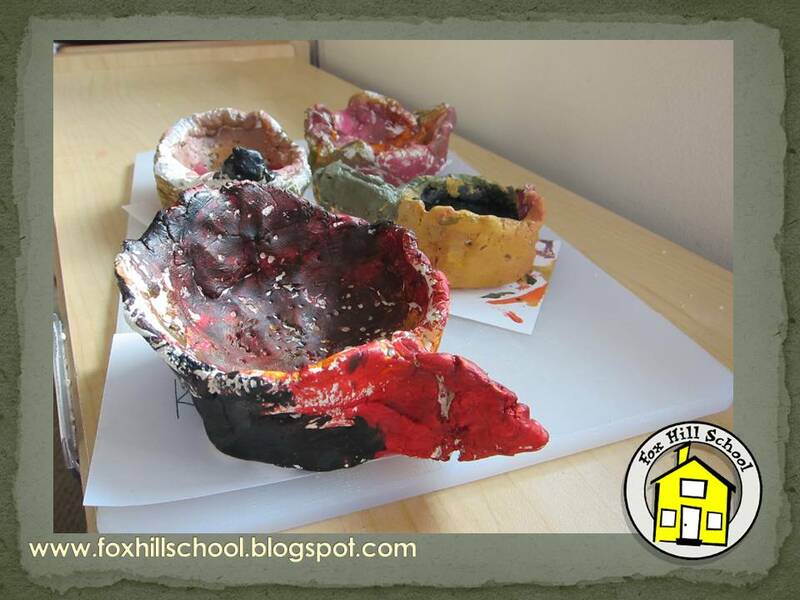 Some of the shapes had been painted with tempera paints by the children last year and some were natural wood colored. We didn't give them an example or any further directions and let their creative imaginations run wild! This activity is so fun to watch the children do! 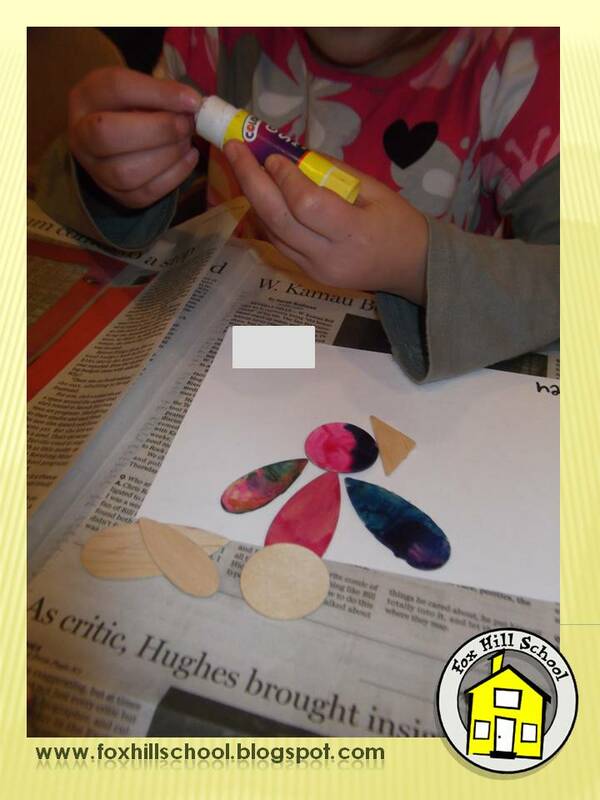 It is a fun woodworking activity, a very creative art project and a wonderful fine motor activity all at the same time! When you are in limbo between Halloween and Thanksgiving and you have gourds galore, instead of tossing your jack-o-lanterns, watch them decompose! During the week of Halloween, we cut open pumpkins to observe with magnifying glasses. Instead of throwing them away at the end of the week, I grabbed an old plastic container and placed the pumpkins inside. During group time, I showed the children the pumpkin and the jar. I placed the pumpkin inside, sealed it with clear packing tape and explained that the jar was never to be opened again. ( Moldy pumpkin does not smell appetizing!) Then we hypothesized about what may happen to the pumpkin. The next few weeks we will observe. 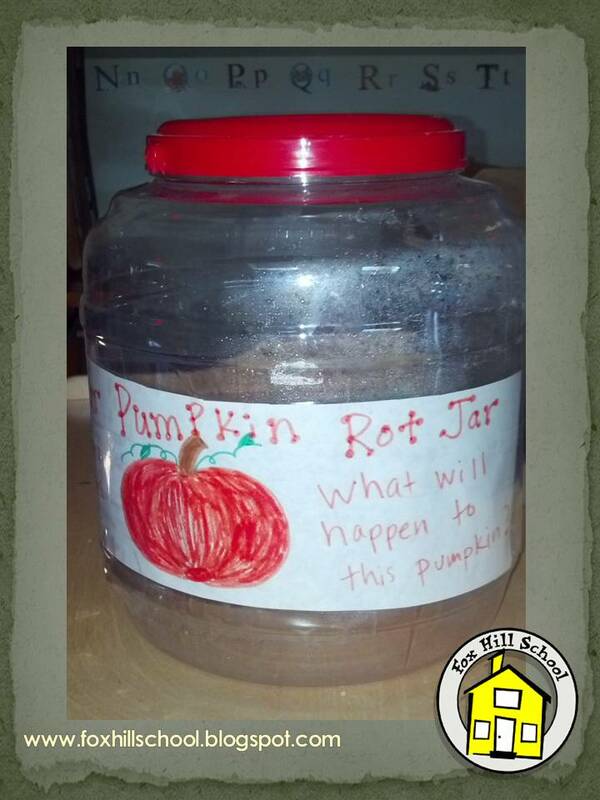 We keep small clipboards with paper and colored pencils in the science area near the rot jar so the kids can draw a picture progression of what they see happening to the pumpkin. You could even keep a rot journal if you wanted! 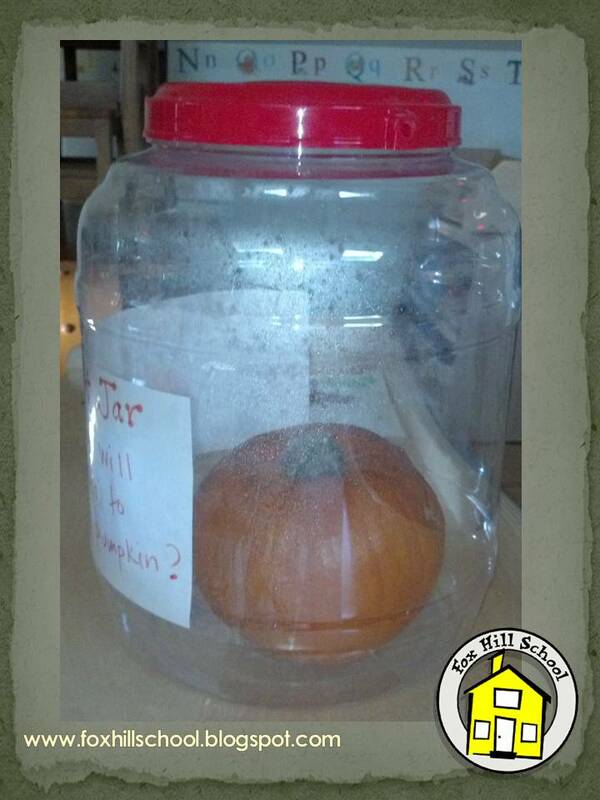 In our upstairs classroom we have placed an uncut pumpkin inside which tends to be a slower process. Either way, the children have a first hand account of how pumpkins rot and decompose just like in our support book Pumpkin Circle by George Levenson. Bundling Goodies for Fine Motor! Our focus book Thanksgiving at Our House by P.K. Hallinan illustrates homemade goodies being delivered in cloth bundles to neighbors and friends. 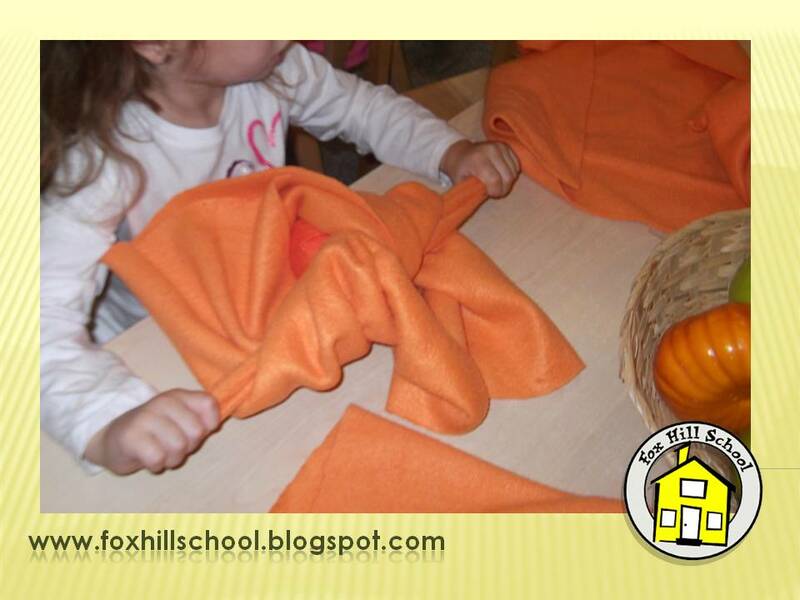 This bundling activity is a great fine motor and motor planning activity. Lay out a large piece of fabric. We used felt-like fabric but next time I would use something not quite as thick to make it easier to tie. Place goodies in the middle of the fabric. We used plastic pumpkins and apples from dramatic play. Fold 2 opposite corners toward the middle covering some of the goodies. Take the remaining opposite corners, one in each hand. Encourage the children to stick with it to completion. Most of them should be able to at least make a single tie, not necessarily a knot. Coach them along until they are successful! Easy & fun!!!! You can use this activity during any holiday season. Just mix up the goodies offered for bundling. Here's a fun and easy math game! Leaf Count - Make a board with an empty tree on it. It can be a large poster board, or even a standard 8.5"x11" sheet of paper. Simply make the basic shape of a bare tree. 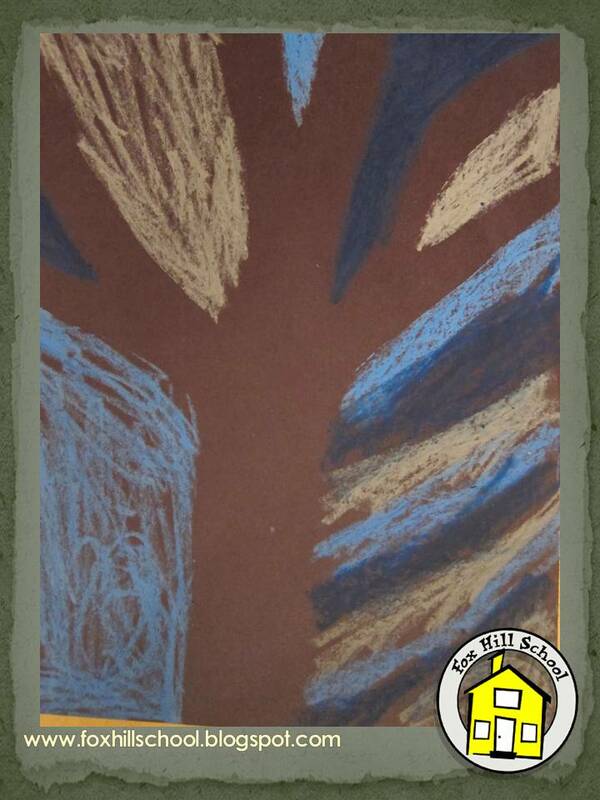 We painted our tree with brown tempera paint on a poster board. 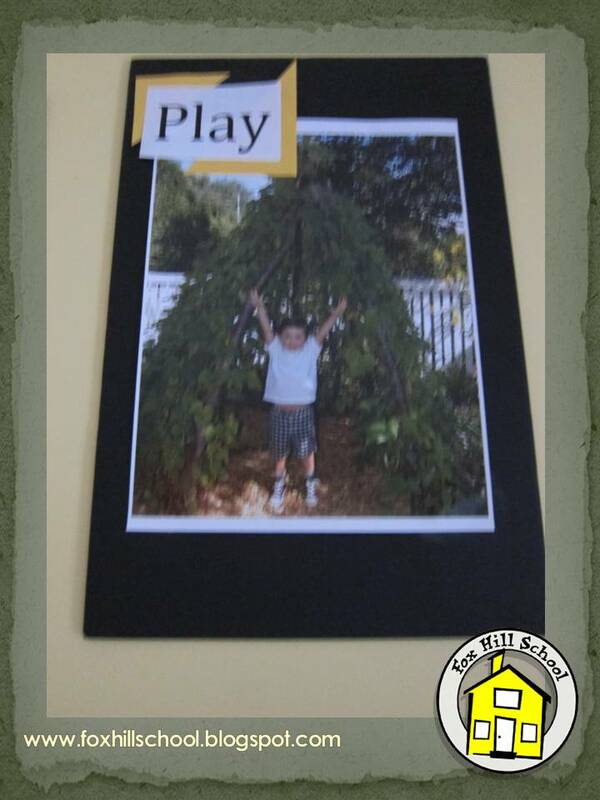 Children can play in pairs on the smaller version, or in groups of 4-5 with the larger tree. 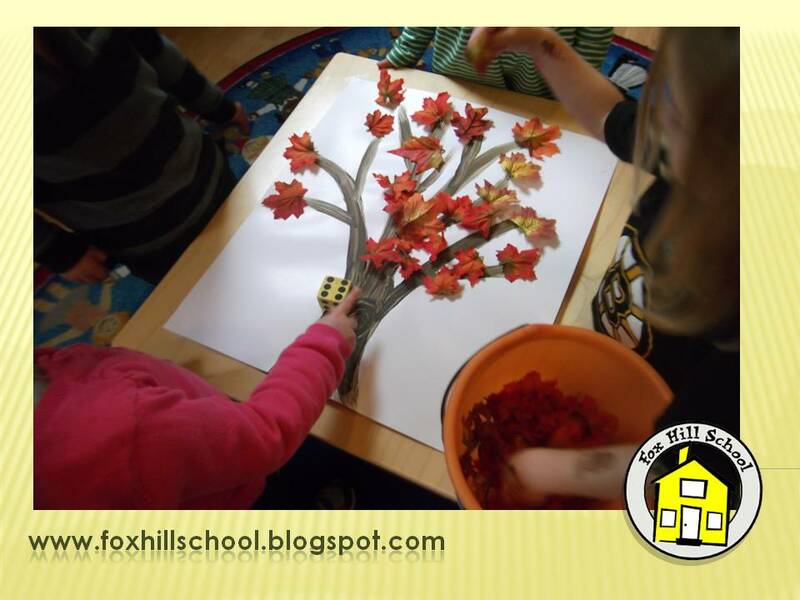 Have the children roll a die and put the corresponding number of leaves (fake or real) on the tree. When no more leaves are left to place on the tree, they can start rolling to see how many leaves they should have "fall" off the tree! Since there is no definitive end of the game they could play it over & over again --- avoiding the I'm-Done-&-Run-Syndrome! This is a fun and noncompetitive way to reinforce simple math concepts, and teach the skill of waiting for your turn to roll the die! 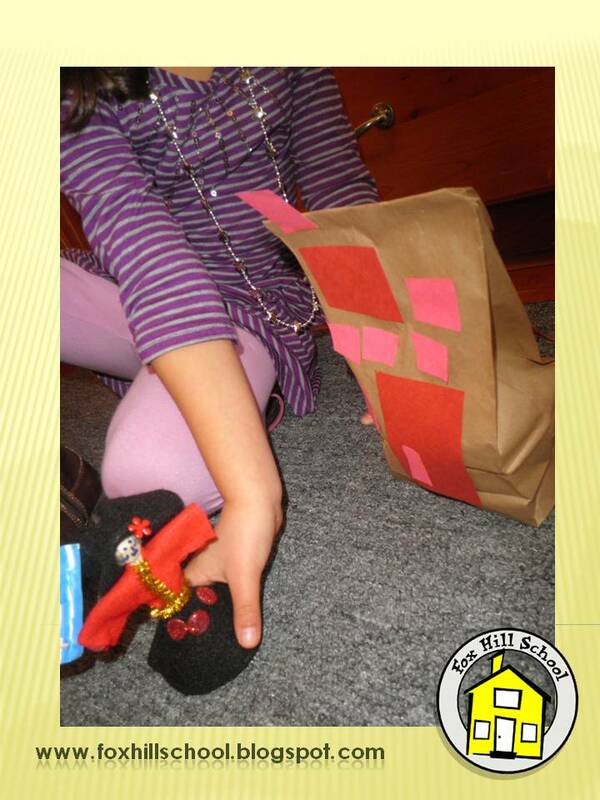 Math and social skills wrapped up in an easy-to-make game! Teacher Tip: Whenever you take the time to create a game like this, it's a great idea to have it laminated so you only need to make it once! Take the effort to have it be aesthetically pleasing the first time, and never have to create it again! If your school doesn't have a laminator, bring it to your local Lakeshore Learning Store or an office supply store like Staples. Make sure you request the thinner 3mm lamination. The 5mm is very expensive, but the 3mm is worth it! Take Home Test Tubes - Science On The Go!